Side Effects Software has released Houdini 15.5, the latest update to its 3D animation and effects software, adding new modelling and UV features, extending the crowd animation toolset, and adding a new VR camera. As with Houdini 15 itself, the new features break down between those targeted at the software’s traditional core audience of FX TDs, and generalist artists drawn in by initiatives like Houdini Engine. There are also new texturing options, particularly for games artists, including support for triplanar texture projection and improved UV unwrapping and packing: you can see them at 01:55 in the video above. Riggers get support for Delta Mush smoothing, which reduced unwanted deformations in a character without losing detail, helping to reduce artefacts when the character is animated. 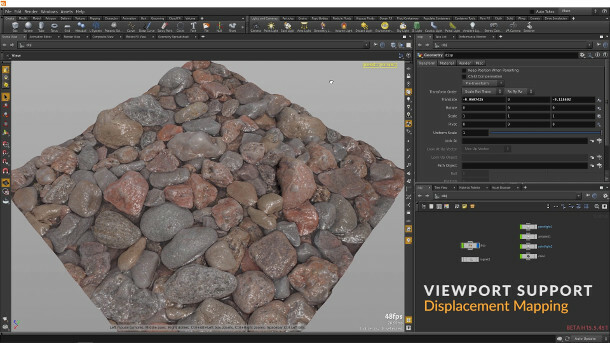 Other new features include support for OpenGL displacement mapping in the viewport and – as is becoming pretty much obligatory in any update to a DCC application this year – a new VR camera. According to Side Effects, Houdini’s VR camera is “based on a VR lens shader that lets you render … Latlong spherical projection, a perspective Cube Map or a stacked Cube Map 3×2. The camera lets you set the eye separation and eye-to-neck distance, and can be used to render to Houdini’s built-in Mantra renderer”. There are also a number of smaller new features, which you can read about on Side Effects’ website. Houdini 15.5 is available for Windows, Linux and Mac OS X. The full version, Houdini FX, costs $4,995; the base edition, which lacks the FX and dynamics toolsets, costs $1,995. Both prices are for node-locked licences. Anyone earning under $100,000/year can use the output-limited $199/year Houdini Indie edition – which, as announced last month, now supports RenderMan, Arnold and Octane as well as the built-in Mantra renderer. There is also a free Houdini Apprentice edition for non-commercial use.